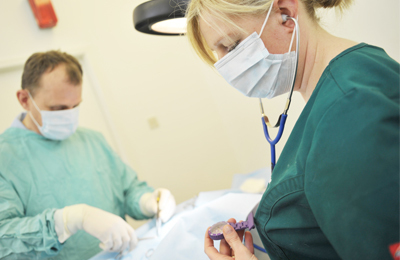 Each of our 4 small animal surgeries has a fully equipped surgical suite, along with skilled veterinary surgeons, allowing us to perform a wide range of operations, from routine to emergency, on a variety of species. During your pet’s stay with us, they’ll be treated like a VIP. Our kennel facilities provide a comfortable accommodation for inpatients and our nurses help provide excellent post-operative care until each animal is fully awake and ready to go home. On discharge you’ll be given post-op advice and be offered a follow-up appointment to check all is well with your pet. If your pet requires hospitalisation overnight there are no staff permanently on the premises but your pet will be checked as deemed appropriate by the Veterinary Surgeon.